I have installed both Redshift and f.lux on my Ubuntu 16.04 machine to try to change the color temperature of my screen. I can open the apps, but neither of them has an effect on the screen color tone. On F.lux, when I try to preview the color temperature, nothing happens. Does anybody know what could be going on here? Why isn't this working? Note, I am using an NVIDIA GeForce GTX 980 Ti GPU. then it just worked. I can even close and reopen it now and it works fine. So I figured out how to use Redshift with my system. Basically, I was using the wrong display driver. 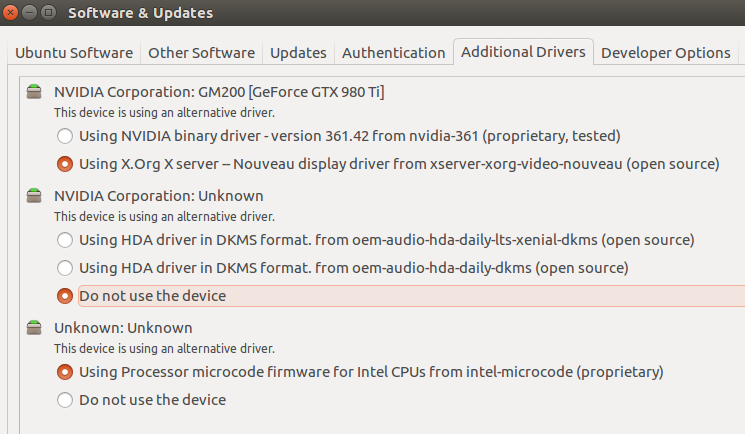 When I went to the Additional Drivers tab in the Software & Updates app, I noticed I was using default Nouveau driver instead of the latest NVIDIA driver, and had the other tab set to "Do not use the device". when I switched it to the NVIDIA driver tab and HDMA Driver with DKMS Format (daily-dkms) tab, and restarted the machine, it finally worked. I'm using Linux Mint 18.2, but it is based on Ubuntu 16.04 and I have many of the same problems pop up, including this one. I just managed to resolve this on my laptop running a GTX 940 on the Nvidia 384.90 Driver and I will test it on my desktop with a 1070 tomorrow. redshift -l geoclue2 which allowed me to start the redshift service and everything was working fine. I then moved on to making sure that it worked on startup by opening up 'Startup Applications' and adding the last command as a custom command there. By clicking 'run now' I was able to test that it still worked but also run it as a background service as opposed to directly in the CLI. I tried to get both f.lux and Redshift to work without any solution so I just opted to go another route. 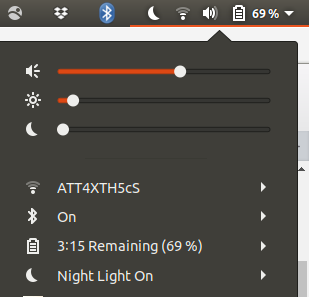 So I went to the Ubuntu Software Manager and installed Night Light slider as pictured below. It works and certainly isn't making me die from strained eyes and a headache from earlier in the evening due to no sleep. Once installed, it just appears in your top right drop down menu and can be toggled to user preference. I just pause the f.lux and then un-pause it, and it worked for me. Not the answer you're looking for? Browse other questions tagged 16.04 colors redshift f.lux or ask your own question.